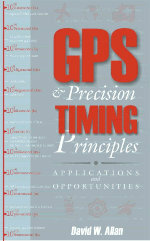 John Wiley and Sons have asked David Allan to write a book on "GPS and Precision Timing Principles: Applications and Opportunities," with anticipated publication in the Fall of 2000. To the right is a proposed cover for the book, designed by son-in-law, Kevn Lambson. "John Wiley & Sons, Inc., develops, publishes, and sells products in print and electronic media for the educational, professional, scientific, technical, medical, and consumer markets worldwide." Voted one of the "World's Most Respected Companies"